The idea of producing my own "High Quality" valve microphone, always appealed to me. Having built various valve microphones, for use in my own studio, I felt it was now time to design a model suitable for the "Professional" user. At this time, 1995, there was very little in the way of "New" valve microphone production taking place. The only "High Quality" valve microphones available, were the old AKG's, Neumann's etc. It was not until some years later, that we saw the resurgence in valve microphone production, that has now (2005) escalated out-of-control. It would all start, with the construction and testing of the various prototype microphones. Carrying out measurements on a microphone, might well give you all the technical data you require, however ..... you still need to know what it sounds like. After all, that is the reason for using it for ! Fortunately, being involved in the local music scene, I was able to "Test" the various prototype microphones at various practice sessions. The music would be in the form of "Orchestras", through "Brass and Big Bands", to "Rock Groups". Once I had overcome the various problems, that were encounter along the way, I was ready to design the "Production" version. A process that would take very much longer, then I had originally anticipated. I was lucky enough to have the use of a friends workshop. This was fully equipped with "Industrial" lathes, together with a milling machine. Machining the various parts, required for the case and internal mountings etc, would take many hours. Having to "Correct" any problems along the way. However, the final was design eventually completed and production could commence. Externally, the prototype VM-951 looked very similar to the AKG C12. Indeed, I used a modified C12 type "In-line Connector", for the microphone base/connector. This enabled the microphone to be used with a standard AKG C12 "Stand mount" type of connector. The microphone was quite long, allowing room for plenty of various component changes that were to take place during the testing stage. On the prototype, brass tubing was used for the housing. This proved to be very "Workable" and acted as a very efficient electrical screen for the microphone electronics. 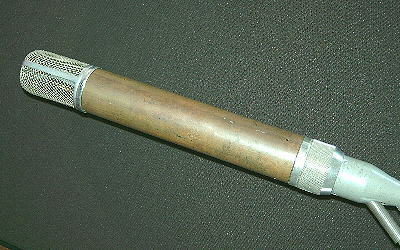 Therefore, the same brass tubing is used in the production version of the VM-951. This time, with a "British Racing Green" powder paint finish. As this was only a "Prototype", then the quality/principle of construction was not of great importance. Therefore it was decided to have two 6BA threaded brass rods, running parallel the length of the microphone. Being fixed in the connector assembly at the base and the capsule mounting lugs at the top. 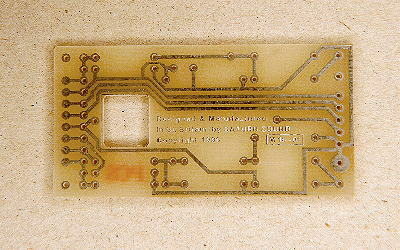 Small tag boards could then be used, to accommodate the majority of the components. The layout, through need rather then anything else, following that of microphones such as the AKG C12 and Schoeps CMV51. Using such a layout, enables the valve connections, to be located as close as is practically possible, to the capsule wiring. Thus keeping inter-connection capacitance down to a minimum, and maintaining an excellent transient response.. 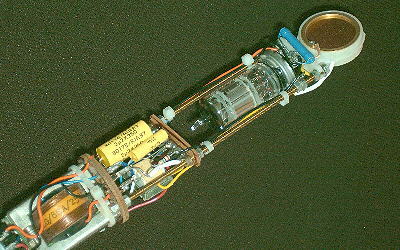 The "Original" output matching transformer, used during testing, was of a BBC design. This proved to be a very good match for the chosen valve. The core, of this transformer, had quite a large "Cross sectional area",. Something not often found in microphone designs, other then the likes of the Neumann U47, M49 and M50. Not forgetting, the early versions of AKG C12. This large "Cross sectional area", enabled the design to have an excellent overload performance at LF. Therefore, the prototype VM-951, was able to capture the "Weight/Force" of the sound being recorded, with great ease. 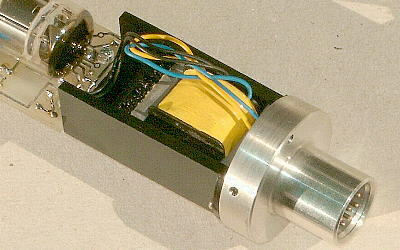 The "Output Matching" transformer used in production version of the VM-951, is of the same design as that used in the prototype, be it of a slightly different appearance..
Having finally arrived with a circuit design that "Match's" the microphone design requirements, it was time to "Re-design" the microphone, suitable for mass production. Aspects of the microphone assembly, would also require some consideration. It was decided to use a PCB, for component mounting, rather then the larger and bulky tag strips as used in the prototype. This could be easily "Pre-populated", ready for fitting into the microphone. The design of the PCB has changed over the years, to enable a "Common" PCB to be used in other microphone design's. 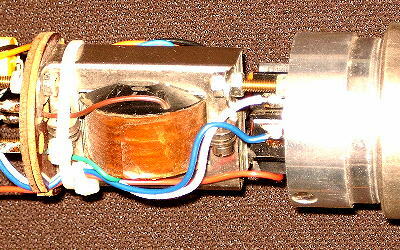 The valve used in the VM-951, is mounted on a valve base, which in turn, is then wired to the PCB. In future microphones, a wire ended valve could easily be soldered directly to the PCB. For reasons already mentioned, it is wise to keep the "Interconnection" between the capsule and the valve grid, as short as practically possible. The valve used in the VM-951, is of a "Plug-in" type, and the associated valve socket, is mounted directly beneath the capsule, on the capsule mount. Therefore meeting the requirements above. The microphone design, requires the capsule mount to "Anchor" the top/upper end of the PCB. Forming part of the main internal structure of the microphone. The "Prototype" version was engineered from aluminum. This being easily machined and modified, until correct. The lower end of the PCB being "Anchored" to the transformer mounting frame, which in turn, is mounted to the base/connector assembly. 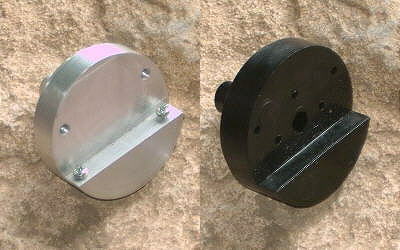 The transformer, as mentioned above, is a snug fit into the ABS transformer frame. A modern 6-pin "Cannon" connector is fitted into the base of the VM-951. The base/connector of the microphone being machined from solid aluminum. The microphone "Housing Tube", being a slide fit over the entire microphone. Being secured in place, by three Grub Screws. Much like the principle that is used on the AKG C12 and many other microphones.